Discover benefits of pomegranate, for the body, inside and out! Pomegranate is a sweet fruit grown on the Punica Granatum, deciduous, tree. It can be as small as a lemon or as large as a grapefruit. It has a thick, reddish, skin with approximately 600 seeds inside. Each seed is enclosed in a translucent, water laden, pulp. Pomegranate is a tasty delicacy. Whether you're searching how to lower LDL, (bad cholesterol) to improving your skin condition, you'll find helpful information here! Find pomegranate recipes that are healthy for the body, inside and out! Benefits of pomegranate are found in commercial and homemade skin care products! If make your own bath and body products, learn the cautions of using essential oils, including pomegranate oil. Pomegranates contain polyphenols, powerful antioxidants, preventing against free radical damage. Free radicals are unstable molecules that can wreck havoc on the body, inside and out. They can damage cell membranes and DNA, risking your overall health. Pomegranate has more antioxidants than cranberries, blueberries, or even green tea! Pomegranate contains vitamins A, C, E and K. Vitamins A & C combat colds, flu or other viral infections. They are eye, bone and heart healthy. Vitamins E & K promote blood circulation and coagulation. These vitamins initialize the healing process. They are skin and heart healthy. Pomegranate has a high mineral content with folic acid, iron, calcium, fiber and potassium. Be choosey when purchasing pomegranates. Find ones that are medium to deep red in color with no cracks or splits. They should have a thin, tough, skin that feel firm in the hand. Check for soft spots or weeping fluid. You want to make sure they're not spooled inside. Eat them within one to two weeks of purchase. You can store them in refrigerator, for extended use, for up to one or two months. They should only be left at room temperature for up to two to three days. Discard all spoiled fruit, since bacteria sets in, causing digestive problems. CAUTION! 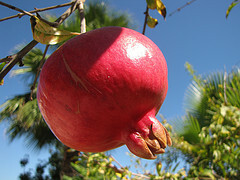 Pomegranate fruit is normally safe to eat when consumed in moderation. An overdose of its seeds, oil, juice or extract can cause diarrhea or upset stomach. Rare cases may involve allergies to the fruit. Contact your health care provider immediately and discontinue use if you notice any of these symptoms: itchiness, swollen tongue or lips, difficulty swallowing or breathing. Pomegranate is skin healthy. Its seeds contain a juice with ellagic and punic alagin, that fight damage from free radicals and preserve skin collagen. It's a powerful source of phytonutrients! Improve complexion. --- CIRCULATION SMOOTHIE: (By Dr. Oz) Combine 1/2 cup pomegranate juice, 1/2 banana, 5 strawberries and 1/2 cup yogurt to blender. Blend until desired consistency is reached. This smoothie will get your blood pumping and help keep your arteries clear. It is chockfull of ingredients with antioxidants! --- PARADISE SMOOTHIE: (By Keri Glassman, R.D.) Place 1 medium ripe peach, (sliced), 2 tbsp. Hass avocado, (chopped), 1/3 cup unsweetened frozen strawberries, 3/4 cup fat-free plain yogurt, 3 tbsp. 100% pomegranate juice, 1 tsp. grape seed oil and 1 tsp. pure vanilla extract into blender. Puree about 15 seconds or until smooth. Pour into a tall glass and serve with a tall straw. This smoothie recipe will help to improve overall complexion and reveal a natural glow. --- SKINNY SHAKE: (By Dr. Fuhrman) Blend together 4 ounces pomegranate juice, 1 cup frozen strawberries, 1 cup of ice and squeeze of lemon in a high powdered blender. This drink helps support weight loss efforts and promote detoxification. It is low in calories with disease fighting nutrients. --- ANTI-AGING SECRET: (By Paula Abdul) Eat a half cup of pomegranate seeds each day to satisfy cravings with nutritional benefits. Avoid staining hands by submerging pomegranate in a bowl of water and break open to remove its seeds. Pomegranate seeds are low in calories packed with phytonutrients. They can help skin look radiant and youthful. --- HOMEMADE FACE MASK: Cut or break open pomegranate to expose seeds. Remove seeds and place in container. Spread seeds over face, avoiding eyes. Leave on for approx. 15 to 20 minutes. Rinse with warm water. Gently pat dry. If you make your own homemade skin care products, such as soaps, lotions or scrubs, pomegranate oil is a beneficial ingredient. The benefits of pomegranate are numerous! Know the cautions of using essential oils. Essential oils contain bioactive ingredients. This means they contain natural chemicals that interact with biological systems. They're potent chemicals and should be used with care! CAUTION! Never use large amounts of essential oils externally, or internally. Never use them straight. They must always be diluted in carrier oil, or soap, lotion, or other buffering agent. Finally, never use them without knowing what their bioactive compounds are known to do.